In 1929, the Mayo Clinic’s Dr. J. R. Crewe wrote an about the miraculous healing abilities of raw, grass-fed milk. The protocol for his “Milk Cure” was simple – put patients on bed rest and feed them nothing but a couple of gallons of milk a day. While some of you may be thinking that sounds like a recipe for a severe case of lactose intolerance, consider that the milk he was speaking of is nothing like the kind you find in the grocery store today. 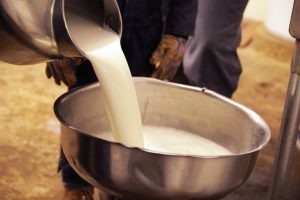 Like almost all milk of that time, the milk Dr. Crewe was speaking of was the unpasteurized, non-homogenized, rich-in-butterfat milk of heritage-breed, pasture-raised cows. The results were so “uniformly excellent” that they changed Crew’s entire “conception of disease and its alleviation” and inspired him to open a sanitarium where he used raw milk almost exclusively in the treatment of all kinds of disease. Despite the wild success of “The Milk Cure,” it has since been long forgotten. The Weston A. Price Foundation speculates two reasons for this: 1. Mainstream milk is no longer a medicinal super-food, it’s a disease-causing, denatured, highly processed product of factory farming. 2. The medical industry can’t make any money from it. “The method itself is so simple that it does not greatly interest most doctors and the main stimulus for its use is from the patients themselves,” Crewe noted. Luckily, if you look hard enough, you can find a growing number of farmers providing the good, old-fashioned stuff, straight from healthy, pasture-raised cows. Find a farmer near you on RealMilk.com.